This page will, hopefully, be updated soon. The Bren .303 light machine gun (LMG) is probably the easiest and cheapest one to install on an Austin Champ and they look good - the gun bolts directly to the top of the post. A Bren will cost around £350 to £500 depending on condtion and model. A post is needed, there are reproductions of these, price from a dealer are around £100.00 (see note later on mountings). A Bren machine gun (mg) mounting post is shown below. 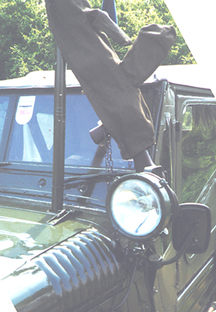 The machine gun on an Austin Champ required that the windscreen be folded down but one Austin Champ owner has made an extended mounting so the windscreen can be left up, whether this was ever done in the army I don't know. The extra height of the gun does put more load on the post itself and on the Champ mounting. Bren mounting: I have known one of these break at the top ring when the Champ was being driven. If this happens the falling mg is a danger to passengers and to other road users. The mount that broke, according to the owner, was a reproduction. I have seen military vehicles near shows being driven to the local shops with an mg mounted, for the reason that a mounting could break or for 'public relations' reasons I don't think this is a good idea.